At it Again! for Bloomsday! At it Again! the creators of Romping through Ulysses give their insights into the motivation and method behind their work. This month Jessica Peel-Yates reflects on…. Blowing up Bloomsday! As Leopold Bloom would have it Life, love, voyage round your own little world this Bloomsday as you dress up Edwardian-style and explore the city that inspired James Joyce’s Ulysses. Here at At it Again! headquarters in Dublin, we are looking forward to Blowing up Bloomsday on the 16th June. It’s surreal to experience everyone dressed up in their Bloomsday finest, gadding about town while the city pulsates with daily life. A black potato and a bar of lemon soap are Leopold Bloom’s lucky charms that he carries around with him all day. He also has a notebook for jotting down advertising jingles and snatches of thought. But it can bring mischief – French letter still in my pocketbook. Cause of half the trouble. We love to record our Bloomsday musings and doodles and use them to inspire our writings and illustrations. You might like to do the same. 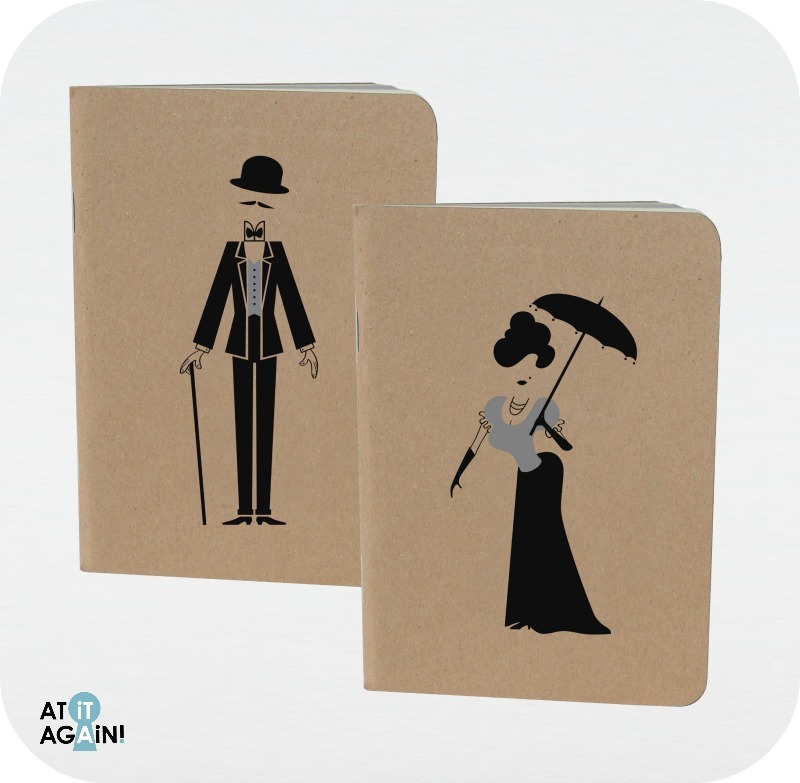 We’ve created the Edwardian Gent and Edwardian Lady notebooks that you can slip into your pocket – or perhaps someone else’s. You can use it for discretely jotting down addresses like flirtatious Blazes Boylan, or composing lines of poetry like ponderous young student Stephen Dedalus. Or take inspiration from the whimsical Gerty MacDowell and use it as a diary for romantic flights of fancy. Why not pick one up at the Joyce Centre or via their website. 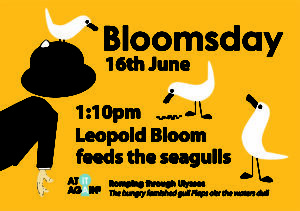 Hopefully we’ll bump into you over the Bloomsday Festival. Here’s what we’ll be up to in Dublin. Join us and bring to life a scene from Ulysses. On the 16th June, Leopold Bloom sweats through Dublin in his black suit and bowler hat. He has been at a funeral, done some shopping and a bit of work on the side. He is avoiding going home as his wife is having an affair. As he goes in search of lunch in the Lestrygonians chapter, he stops by the river Liffey to feed the seagulls. Put on your bowler hat, bring some bread or Banbury cakes and see the seagulls swoop and kaw! Free, no booking required – bring your own bread or Banbury cakes. Tuesday, 16th June, 2-3pm from North Great George’s Street via the Prick with the Stick, Trinity College, Sweny’s Chemist and Davy Byrne’s to Meeting House Square. On the 16th of June, as Leopold Bloom goes about his day in Dublin, he keeps passing five sandwich board men advertising a Dublin stationery company. They walk the streets displaying red letters spelling out the company name. 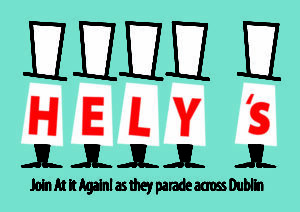 Become one of the Hely’s Men as part of the Bloomsday street carnival. Join At it Again! as ‘S and bring to life a scene from Ulysses.